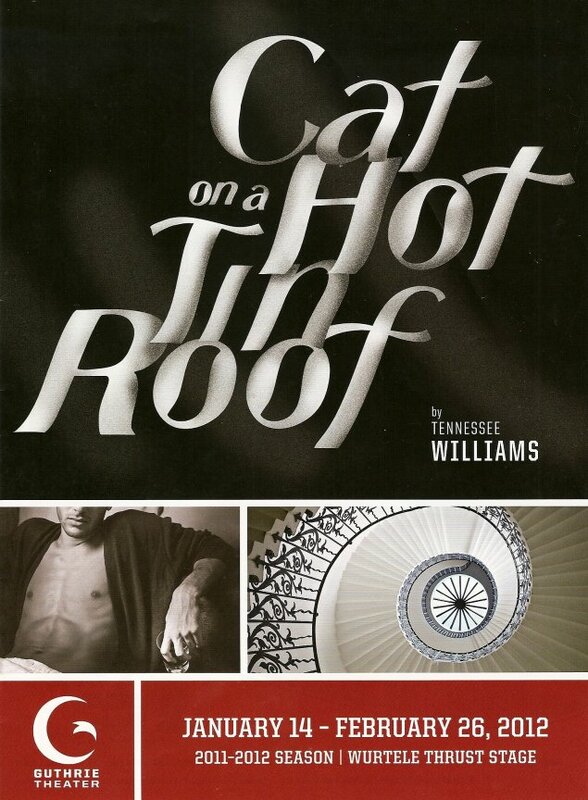 In keeping with the theme for Valentine's Day, I followed the delicious Dial M for Murder at the Jungle with the Guthrie's production of Cat on a Hot Tin Roof, a tale of not just one, but two dysfunctional marriages. Also delicious, but in a much different and darker way. Like Dial M for Murder, I hadn't seen this play before, or the 1958 movie, so I had no expectations. 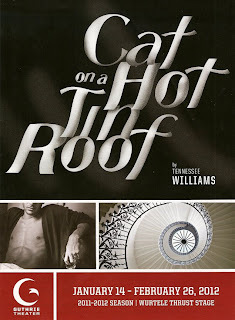 Except that I love Tennessee Williams; his plays are always so intense and really dig deep into human relationships. That definitely holds true of this play as well. For the one or two of you who, like me, have never seen the movie, here's a brief plot summary. Big Daddy is the wealthy owner of a plantation in the Mississippi delta. His two sons and their wives return home to celebrate his birthday. Big Daddy dying of cancer, and everyone knows it but him and his wife Big Mama. Gooper is the elder son, but Brick is his father's favorite, maybe because they're more alike. Gooper and his wife Mae want to take over the plantation, but Brick's wife Maggie is determined not to let that happen. Brick himself doesn't seem to care much about anything, except drinking, since the death of his friend Skipper, which he calls the one true thing he ever had in his life. He's completely shut out his wife, and she's desperately trying to get back in. I'm trying to decide who the star of the show is, but I don't think there really is one. Each character has their moment, and every actor in this cast is up to the challenge (even Gooper and Mae's five adorable children, who continually run across the stage hootin' and hollerin'). Peter Christian Hansen (Brick) always brings a wonderful intensity to his roles, but this one is much more subdued. Brick mostly listens in apathetic silence as others go off around him. He's constantly drinking, and moves around the stage on crutches with an awkward grace, his glass always in his hand. But when he's provoked, he explodes. Until he drinks enough that nothing matters anymore (click). Emily Swallow is wonderful as Maggie the cat, about to jump out of her own skin, desperate to make her marriage work so she doesn't have to return to the life of poverty. Melissa Hart (Fraulein Schneider in Frank Theatre's Cabaret) is amusing and sympathetic as the loveable busybody Big Mama, who just wants her children to be happy, especially her favorite Brick. And David Anthony Brinkley is marvelous as Big Daddy. Such a different role than the last time I saw him, as Big Mama Turnblad in Hairspray at the Chan. It's no mystery why he left that show to do this one - it's such a rich, meaty role, and he inhabits it fully. Chris Carlson and Michelle O'Neill as Gooper and Mae, whose only concern seems to be their inheritance, complete the dysfunctional family. None of these characters are very likeable, but they're all fully realized people. Once again, the Guthrie beautifully brings to life the complicated, messed up world of Tennessee Williams - mortality, mendacity, families, relationships. You can almost feel the sweltering heat through the southern drawls, the set with the towering blue doors and windows, the 50s costumes. It's not a world I would like to live in, but it's awfully engrossing to observe.